The Dorset coast was shrouded in a grey blanket of sea mist yesterday evening that managed to block out most of the suns rays, I debated whether to even set up for a shot but as the sun dipped behind a bank of cloud on the horizon it threw back a little colour that added some pastel pinks and blues to the sky. ~ by David Baker on 25 April, 2010. I was up there last night fishing, having a beer with friends. Ah…you might have been one of the fishermen that I cloned out of the picture. Terrific Dave. 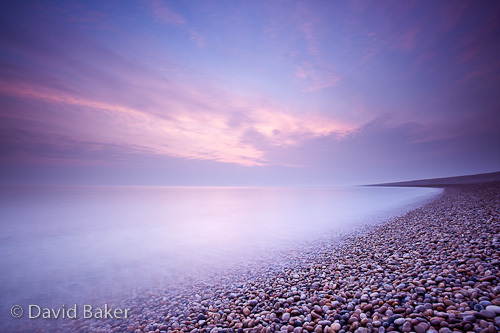 I just love the colour palette in this and the pebbles are picking up all the hues from the sky. I’ve just been reminded by the previous posts that we did not get our Fish & Chips when we were down. That will have to be rectified next visit! West Bay fish and chips are a must next time! The Nachos & Chilli was magic though!